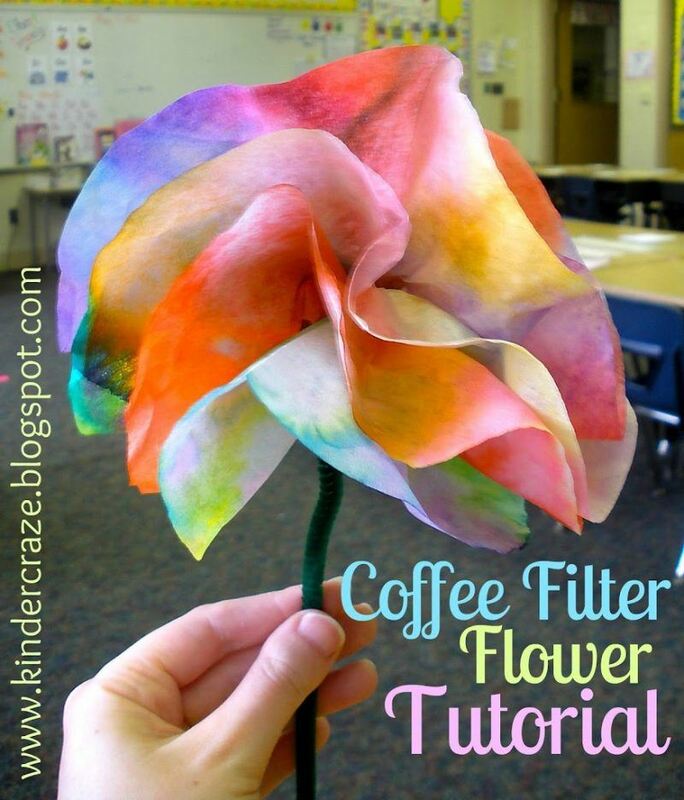 Coffee Filter Flowers Tutorial Did you know you can make beautiful, full flowers with your students with coffee filters and pipe cleaners? It’s a very simple, CHEAP project that the kids will love! Protect your work surface with a table cloth or some sort of liner (the marker will soak through the paper layers and you won’t want to stain your work area with ink. Next, Tear off a sheet of wax paper big enough and place coffee filters on top. I give each students their own sheet of wax paper with coffee filters on top and use a sharpie to write the student’s name on the wax paper. This helps me keep track of who decorated the filters.Now comes the fun part. Use markers to scribble all over the coffee filters. Later on, these colors will get wet and bleed into each other so I try to use colors near each other on the color wheel. Otherwise, you may end up with brown flowers. Next, spray the newly-scribbled flowers with your spray bottle. I usually help my kinders do this part. You only need about 5 good sprays.Set the whole sheet of wax paper aside while you wait for the decorated coffee filters to dry. The colors will continue to bleed as they sit.You can stack the sheets of wax paper on top of each other while they dry. I try to stagger them a bit. Be mindful that the color will bleed a bit through the wax paper as well and complimentary colors (such as orange and purple) will bleed to make brown. After the coffee filters have dried, you are ready to assemble. I always do this part on my own after school. Older students can probably handle this on their own with instructions from you. Stack all filters for a single flower together and fold in half.Now, fold in half again. This is where it gets a little tricky to understand. You basically want your folds to zig-zag. Take the top section of your coffee filters and fold it backward onto itself.Then flip the filters over and repeat for the other quarter section. It will look like this when pressed down.If you let go of the filters, they will open a bit. See the zig-zag?Use a pipe cleaner to tightly wind around the point of your folded coffee filters. Be sure to cinch it tightly so it holds.Gently separate the folded pieces from one another, and then you’re done! Not sure how many coffee filters to use? 2. Paint the paper with watercolors to see the picture appear on the paper. 2. Cut the green straws into pieces to make flower stems. Stick them on the paper plate. 3. Use the “dot” pens or the back of a bottle cap to make the flower petals. 4. Be creative with decorations on the flower petals if you want to jazz it up! I have made recycled crayons before – and I got a little addicted to doing them and made a million for Christmas presents but yesterday was the first time I did it without using an oven. The heatwave on the west coast was in full swing and I decided to try something new… and it worked! 1. Gather your materials. 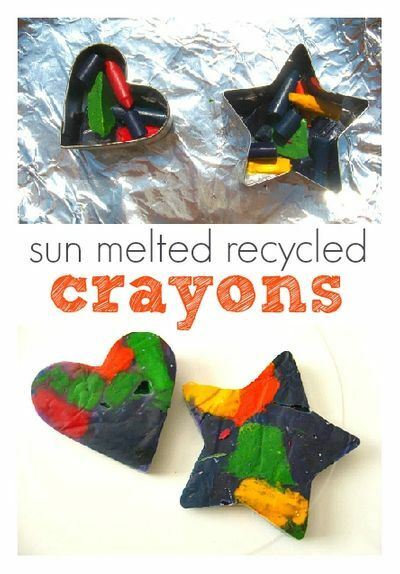 You will need some crayons, aluminum foil, cookie cutters, a paper plate and a very hot sunny spot. 2. Start by peeling and breaking your crayons into small pieces. I left some chunky bits because it was well over 100 and figured it would be fine, if the day was cooler I’d used shavings to melt faster. 3. Start by peeling and breaking your crayons into small pieces. I left some chunky bits because it was well over 100 and figured it would be fine, if the day was cooler I’d used shavings to melt faster. 7. Wait- in 100+ heat this took an hour to melt, but I had lots of really big pieces. 9. Let cool inside, then pop out of the cookie cutters. Mine slid right out, I just broke off the little bit of extra that slipped out on the bottom. 10. 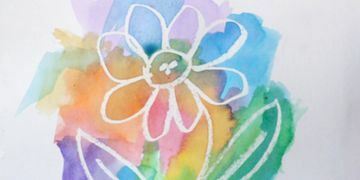 Color on scrap paper for a truly eco friendly activity!